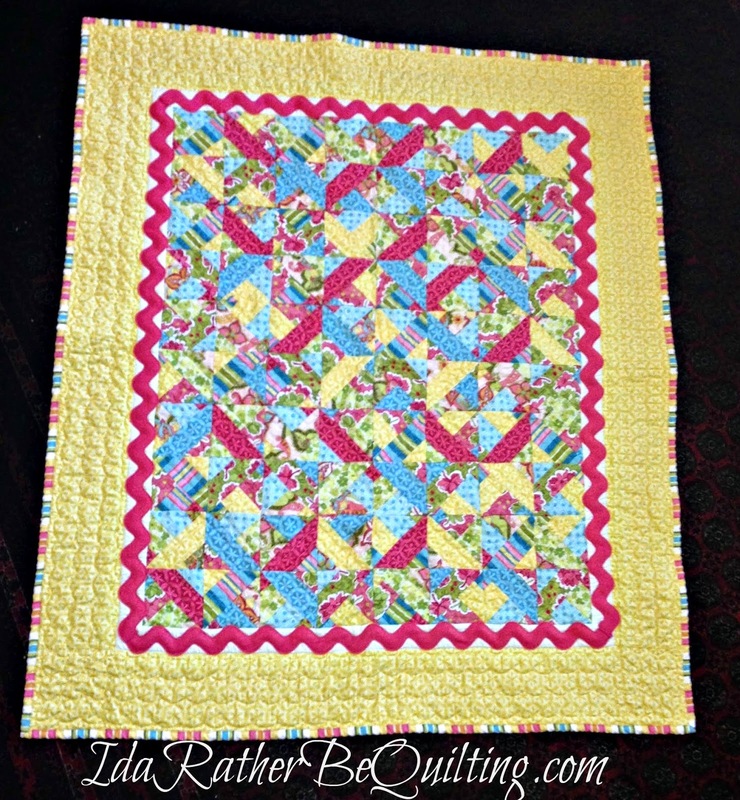 I just love the instant gratification that is a baby quilt. Long projects are great but sometimes they are just so.... well, long. A quick baby quilt project (or two) can be a great boost when my patience and perseverance on the bigger quilts is running low. 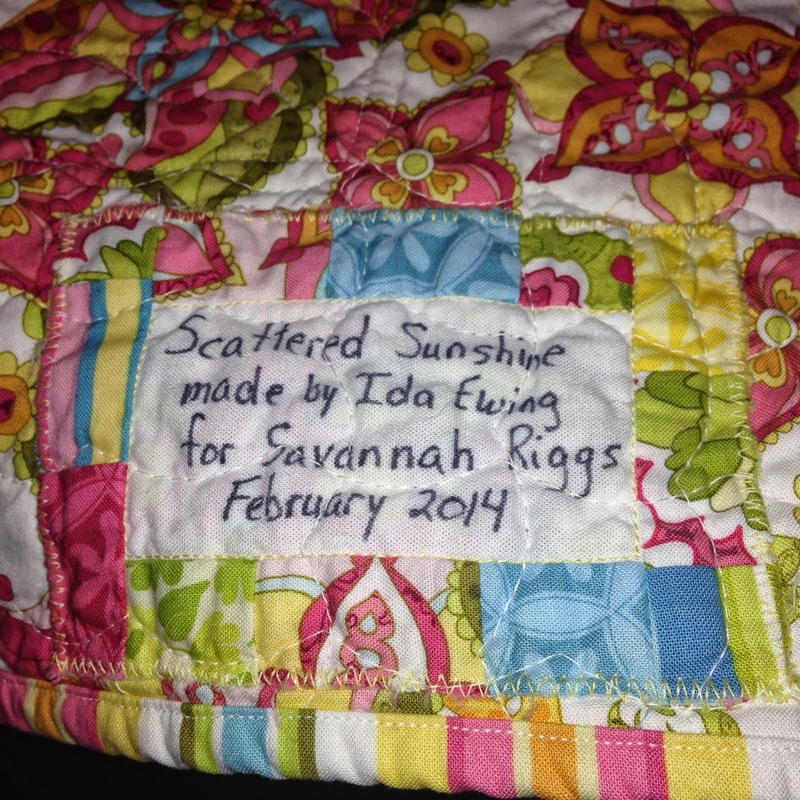 Baby quilt number one is called Scattered Sunshine and was made for my newest niece, Savannah. I tried out a great technique described by Jenny of Missouri Star Quilt Company in this tutorial. 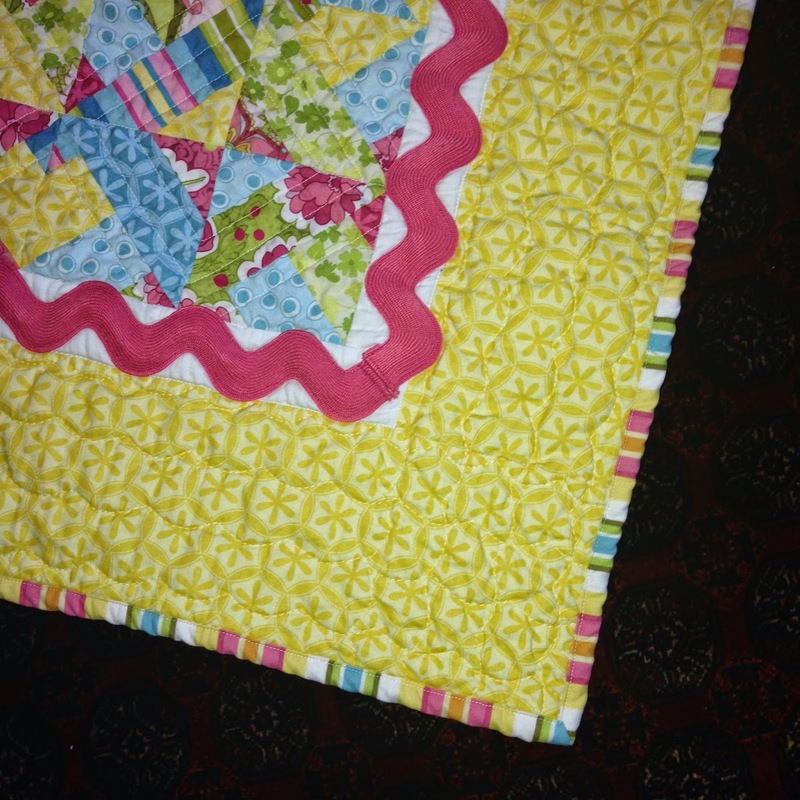 It's a variation of her pinwheel block tricked up by 3 Dudes Quilting. Anyway, it's really easy but with the high contrast of the fabrics and the smaller block size I used, the quilt top turned out quite busy. There wasn't anywhere for your eyes to rest. So I added a wide border of yellow, which I liked but then it was way too yellow. So I bought some giant ric rac, something I'm been dying to work with, and stitched that over the narrow white border. It took me a while to figure out how to do the corners but I think it worked to bring the girliness back a bit. I LOVE love love the backing to this. 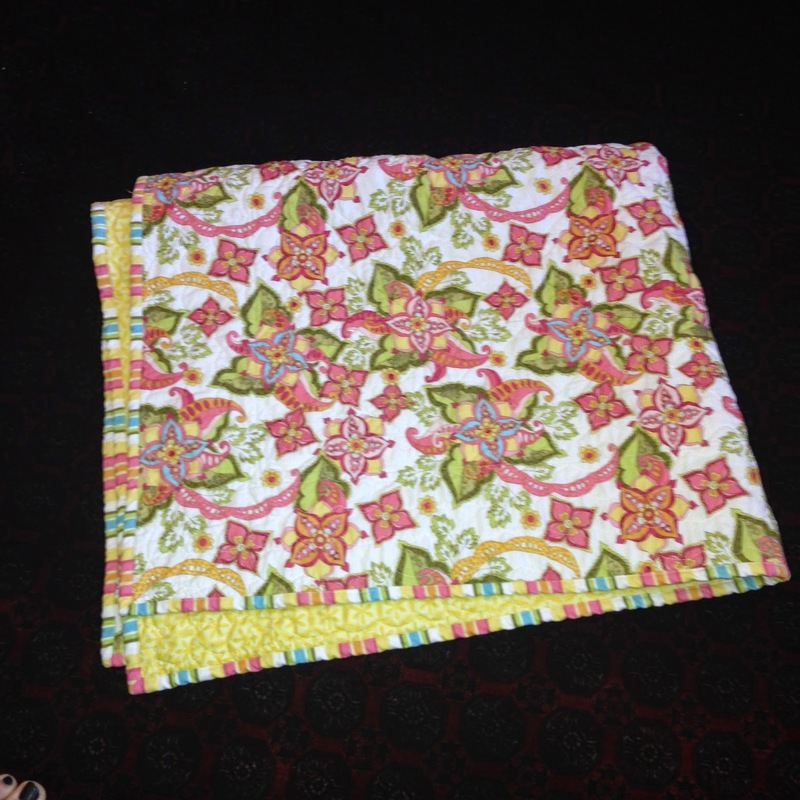 All the fabric were from a kit I bought from Stitches and Sew Forth months and months back. But I didn't love the pattern so it was no hardship to use it for this quilt instead. I have promised to put labels on all my quilts now so here is the label I did for this one. Still trying to decided if I like putting the label on before the quilting or after. Once it was finished and washed up nicely I put it in the mail for Utah, where it will live at my brother's house. Quilt number two was for a cute young mom at church. We discovered one day that her mother and my mother grew up in the same little town in Arizona. And my grandpa was her mom's bishop. Small world. You can see my block dimensions are different. I was working with leftover layer cake squares - the Comma by Zen Chic line. And I didn't have duplicates. 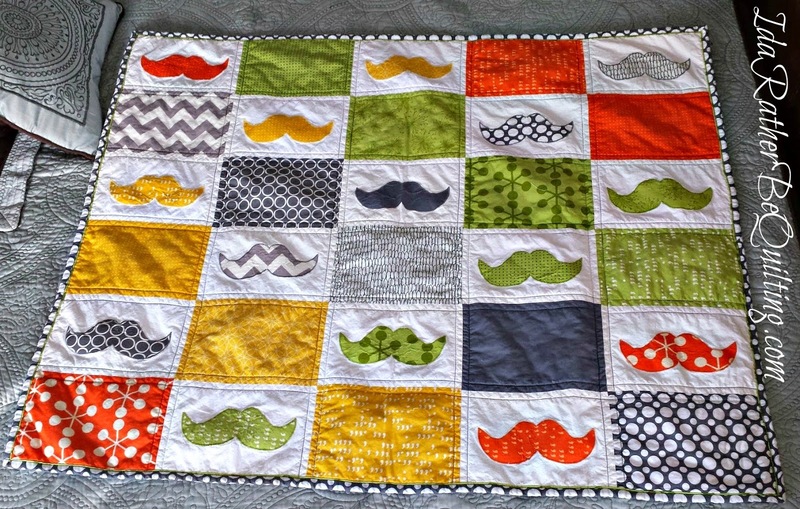 So if I wanted to have a mustache and a matching solid block, I would have to make the blocks rectangular instead of square. I cut three inches off each ten inch block. That was enough to use the mustache template provided by I'm a Ginger Monkey. 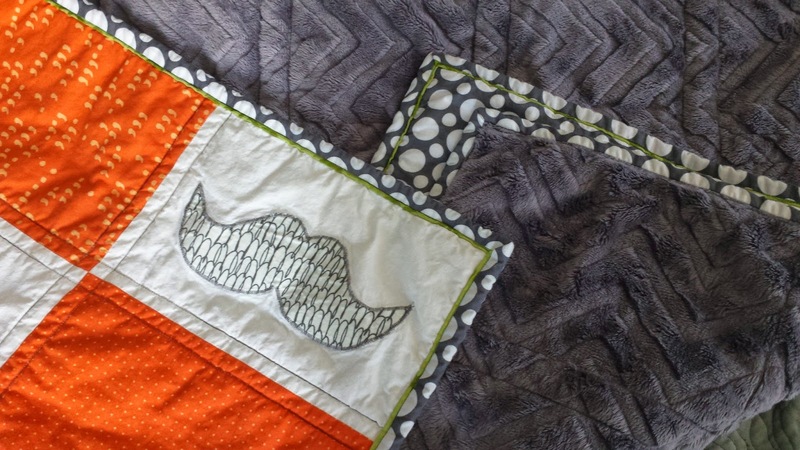 I was afraid that the colors weren't masculine enough so I added a few more greys to the mix and kept all of them in the center diagonals of the quilt. The backing is also grey, in a delicious chevron striped minky I bought at Quiltique, my sort of local quilt shop. The chevron stripes are not heat pressed into the fabric like the raised dots on some minkys. They are sort of shaved in, if that makes sense. So they won't disappear with heat or wear. I also tried a new binding technique. 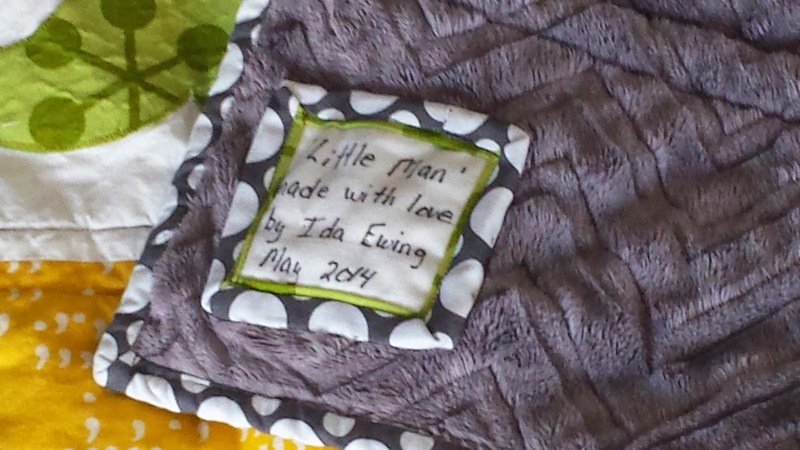 (Baby quilts make an awesome venue for trying out new things.) It's called Susie's Magic Binding. You can find the tute here. The technique is not hard but I still managed to misread the directions and ended up with grey binding with a tiny green flange instead of the other way around. Oh well, I like how it turned out. The green is easiest to see on the label, which I attached after I was done quilting. I think I like that better but I'm not sure it will be as sturdy. Due to a scheduling conflict I wasn't able to go to the baby shower. 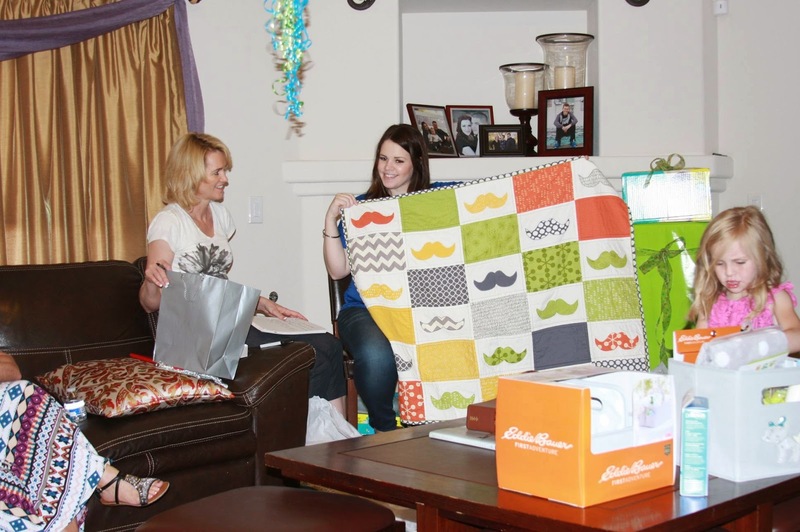 But Cynthia loved the quilt and the mustache pacifier I ordered from Amazon to go with it. Have you seen those? They are stinking cute! I'd love some feedback on the label question - when to you attach it? And any fun new techniques you've recently tried out, on baby quilts or otherwise.